my sylveon and lirrie 's espeon got busy together at the day care center and these bundles of joy happened ! my absolute favorites are 3 , and 5 <3 but there all super cute! it says right in the discription we dont know what were doing with them yet. 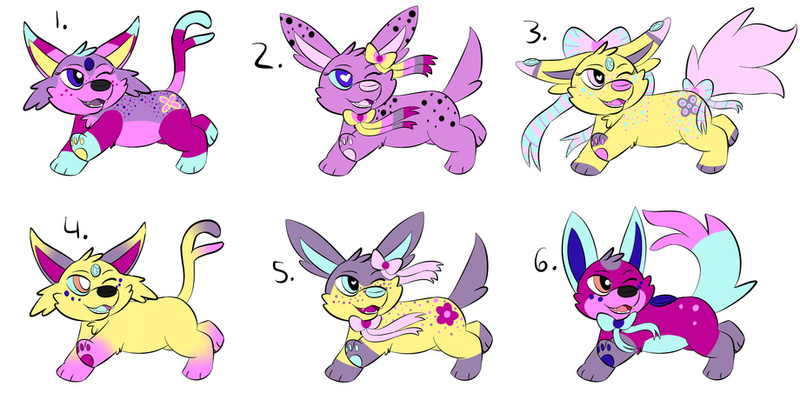 and if we do make the adoptables 1 , im keeping 3 and 5 , and 2. they wouldnt be free. and im just sayin. i get annoyed when ppl dont read the discriptions. if they were adoptables or free it would say so in the discription and or title. if we decide to make them adoptables they will be reposted as such.